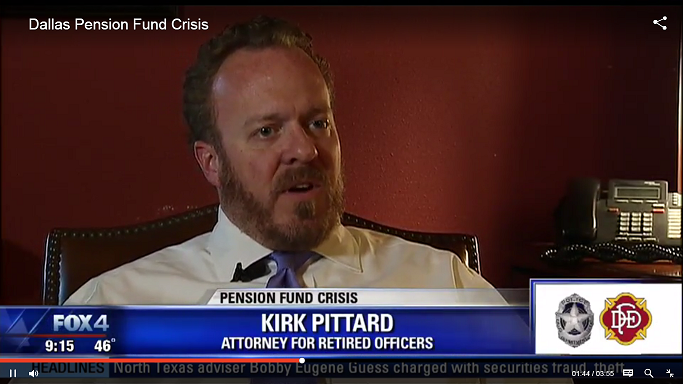 Kirk Pittard helps retired officers get one step closer to reinstatement of their monthly benefits. - KELLY, DURHAM & PITTARD, L.L.P. Kirk Pittard helps retired officers get one step closer to reinstatement of their monthly benefits. Congratulations to David and Cris Feldman who, along with Kirk Pittard, successfully convinced the trial court to partially lift a temporary restraining order that had been in place prohibiting the release of any benefits to retired police officers and firefighters from the Deferred Retirement Option Plan. Today’s ruling paves the way for the Dallas Police and Fire Pension Fund Board to reinstate the payment of the monthly retirement installment benefits upon which many of these retired officers and firefighters rely. Fox 4’s Diana Zoga covered the ruling and interviewed Kirk about the case. You can see her story here.